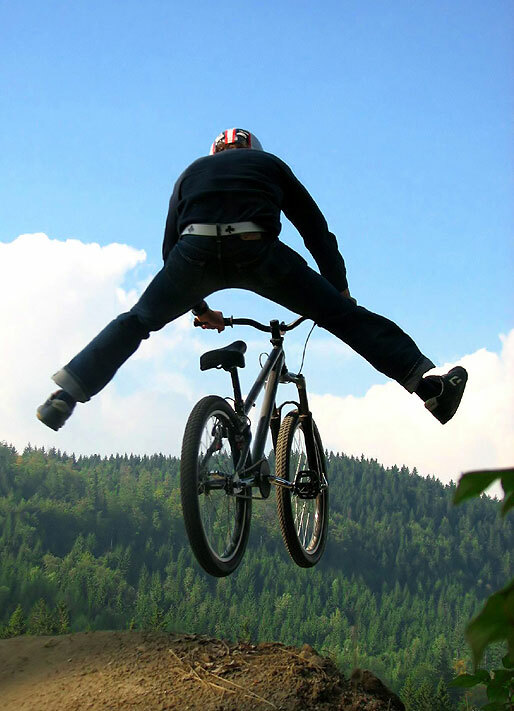 Cycling itself is a fascinating and rewarding pastime, but you can make your hobby even more exciting, if you learn some bike stuntam. Many cyclists don't know where to start their first steps in the extreme Cycling, and if you are one of them, then you might need to know some rules that will help you to learn tricks on the bike. Before you master the technique of extreme skiing, meet your bike – you should know clearly how to operate the brakes, how maneuverable your bike is how fast it gains speed, how it behaves in different conditions. The bike should perfectly fit your parameters, including height and weight. It needs to be equipped with solid rims and wide rubber, and besides, it's not worth doing stunts on bicyclesthat are designed for simple walking and Hiking. During execution of the trick in most cases, you have to stand, so the most convenient is a low sports bike BMX. Determine which leg is leading when riding, and further accustomed to do all turns on the bike on the front foot. Before you can learn simple tricks, learn how to keep balance by holding the front or rear brake. When you are confident to keep balance, standing on the bike, try holding the brake to lift off the ground the front wheel, abruptly shifting the center of gravity back. Hand while lifting the right and try to bounce on the rear wheel. When you start work, try to jump on the wheel forward and then back, stopping myself from falling. For these jumps stand on the rear wheel and make the take-down pedals, scrolling through them on a third ago, and then release the handle the rear brakes and do the dash a lead foot, turning the foot pedal. Re-lock the rear brake. To jump on the front wheel, do the same thing, but clamp the front brake. Also on the rear wheel you can ride – the trick is called "Willie." In order for the trick to work, you need to master described above, a more simple trick. Balance on the rear wheel, tearing the front from the ground, and then on a low grip, rising above the saddle, put your weight on the wheel and take a vertical position. Try to drive forward on the rear wheel, and in order to descend to the normal position, body weight transfer forward. The more difficult trick is the "front end Willie" when riding on the front wheel. This trick is quite dangerous, and to master it you need only when you reach a certain level of professionalism. To learn how to do tricks on a BMX novice rider is not so easy. Need to be proficient in Cycling, have a good physical preparation and special attention to safety. The trick to know and which every rider is called Bunny Hop. It serves to overcome small obstacles and in the process of performing BMX is totally hanging in the air. Most beginners, seeing this trick from the side and trying to repeat it, trying to simultaneously raise both wheels in the air. But they rarely what happens, because this method is incorrect. Ride your BMX at a slow pace. Do the jerk by hands to lift the front wheel to the desired height (but not too much, not to roll over). At a time when the wheel starts to climb, shift your body weight forward to have leveled off the back. More professional feint is considered a Wall Tap. As the name implies, this trick is performed with the wall. During his run, Ryder "outdoor orientation" reverses "the wall". Speeding up to medium pace and calculating the right moment before the wall, remove both wheels from the ground, in the trick "Bunnyhop" (front wheel to lift up to 90 degrees, so the bike stood in an upright position). When you feel the collision with the wall, with all your strength push off in the opposite direction. But do it without the back and body, arms and BMX, to not tip over. 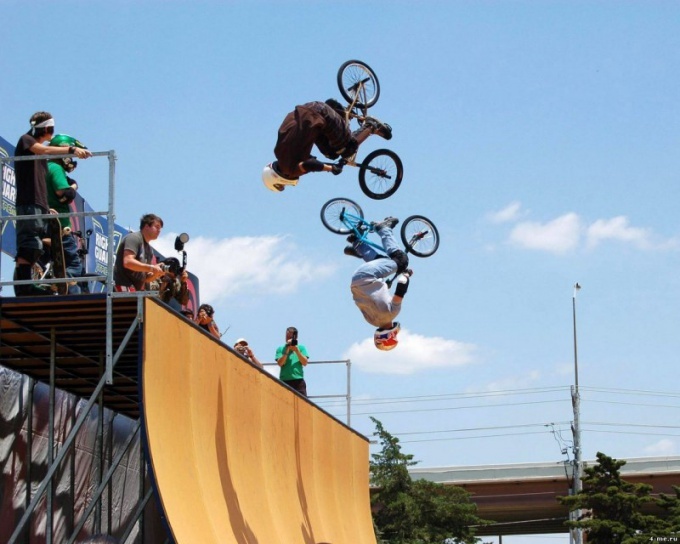 The trick Frontflip is one of the most spectacular and difficult in execution. It is on the ramp and for its implementation it is advisable to prepare a good equipment to avoid injury. This trick involves a 360 degree rotation in the air when jumping off the ramp. Drive up to the edge of the ramp, using caution and slow speed. As soon as the front wheel of your bike will reach optimum height, carry the weight of the upper body over the handlebars. If you succeed, then the rear of the large inertia and small efforts will spread next. It is best to learn this trick on a special ramp with a pit filled with foam.